You mean I actually have to update this?? Oh ye gods Magnum. Its nice outside and I have a cold. My family don’t have the OCD-like desire that I have apparently to wash my hands relatively frequently or something like that as after five or so days of avoiding them, I have managed to awaken riddled with their viruses. Oh Joy. It being a long weekend, my plans of digging out and fully installing our vegetable garden (I know, its late) are not yet thwarted, but will not be the fun and exciting day in the sun I had hoped. 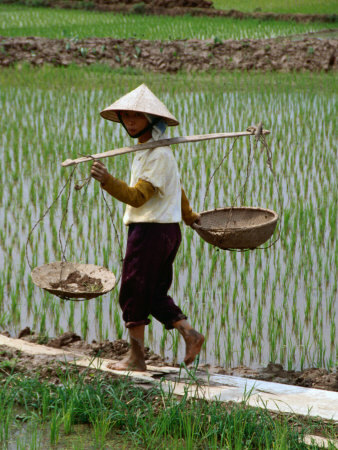 Instead of being a smiling fit farm-boy for a day getting tanned, drinking Iced Tea and smiling toothily and waving at passersby, I will instead look like a sad downtrodden rice paddy farmer from 1974 era Vietnam. Joy. Macrame plant hanger. Don’t buy them, make them you heathen. We always had plants in the house when I was a kid. My mother would sprout pretty much anything that we ate that resulted in a seed or pit. I remember a monstrous avocado plant one time in our back window grown in a glass of water with four or five toothpicks shoved in its sides keeping the pit suspended in water. She had picked up a book called the Guerrilla Gardener sometime in the seventies and like all good hippies she took it upon herself to have little gardens everywhere. Under our stairs, in the backyard along the paved parking area (we had no grass, only asphalt), in pots and other vessels on the porch, throughout the house hanging in braided yarn hanger things. Always, we were surrounded by plants. Perhaps this is why I like living in the country surrounded by the woods and perhaps, having grown up in the city surrounded by manufactured jungle it is why I am yearly confused as to WHY THERE ARE SO MANY BUGS WANTING TO EAT ME. Anyways, every year since maybe 2004 we have had a nice big garden and it has been my job to turn, rake, plant and water. Being me, I have tried to grow the most insane plants I could find with limited success but over time I am accepting that tomatoes (heirloom), beans (purple when I can get the seeds), herbs and yellow zucchini are what we can grow well here. Kohlrabi, no go. Leafy things, they get eaten by critters. Carrots and radishes, cheaper to buy them and sketchy in insect content. This year I have a huge selection of mundane seeds and I am expanding the plot a bit so we will have to see what comes about. I shall update you as time goes on. So I guess I need to talk booky things. Losing Jules is being read by about four hundred people right now. Kindle versions are up and now as of a couple of weeks ago a full hardcopy- tree-killing version as well. A few people I know directly have ordered it and are reading it. No reviews up but thats okay, I am waiting till June when my ninety day contract ends and I will be making it available for KOBO as well due to popular request. I am not so concerned right now about sales and such as I am focused on my second book which is being written now. It is not a novel. It is comedic. It is more along my historic style of ranty satire. I will post a full description of it when I get to the 50% mark. Well, here is the new location for all things me. I will over the next few weeks transfer the old (olde) pages here and Like Happen See will vanish. This is the new location of all things Sean, my writings, references to my book (s) and such and place where I shall ramble as always. Losing Jules in Hardcopy Format!